This transformation has given me the confidence to tackle my own furniture-repainting project! Last year I bought a French-style three-drawer nightstand on Craiglist that was white with gold details just like the picture above. After completing my Dresser Facelift project I did not refinish the night stand and instead just moved it into a spare bedroom as-is, but the white paint on the night stand looks old and yellowed, which seems out-of-place in a new, modern bedroom. Wow. Hey, that carpet looks like the same carpet in my house. Look, she even had the guts to repaint the hardware white. 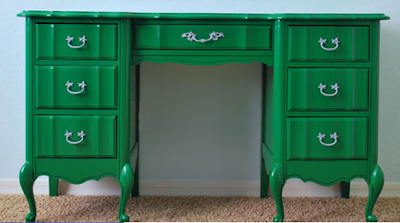 This is a gorgeous jade green color that would really work well with Chinese decor. I think any good, rich color could work! for this technique. What about purple, red, or a rich yellow? 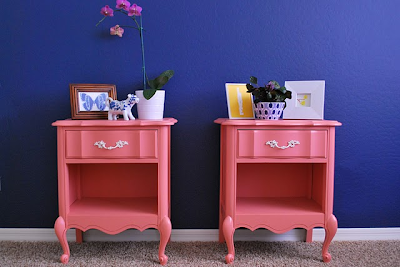 Natty also painted a couple of matching nightstands pink with white hardware instead of continuing with the bold green color. Again, this pink would also work well with Chinese decor, but I love how it's paired here with the blue and white in this photo. 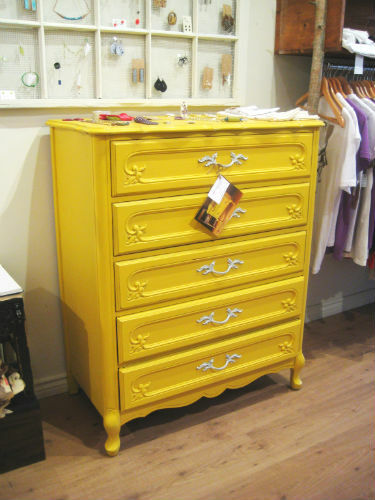 On futher search, I found more painted French-style furniture! Check out this link for a How-To on repainting dressers! Excellent. 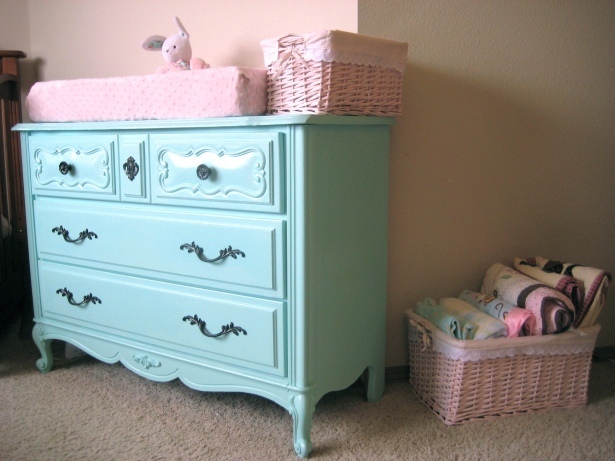 This adorable Tiffany-blue dresser comes with a really great How-To on repainting painted furniture. I think the black hardware looks great with the light blue; white hardware wouldn't contrast as much. 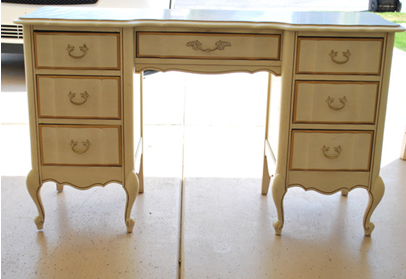 I'm sure I'll have a follow-up post in the future to share how I transform my own French-style night stand. What color will I choose? Hmmm... I'm up to suggestions! I need help! I have a nightstand in this same style which has a laminate type top. Did you just remove the top or paint right over it? I'm worried the paint won't stick. My dresser had a wood top; I just painted it. You might be better off replacing the top with wood. A local wood shop could help you pick out a piece of wood and give it a nice routered edge. Then you just need to sand, prime, and paint. If you get a nice new piece of wood, you could just finish the wood and leave it unpainted after painting the rest of the dresser. It could look nice, depending on your paint color. Plenty of great stuff to have! All above pieces are awesome. I thought I can get best of them but it's ambiguous for me. I got some white pieces of furniture and little bit confused to have the best one among all of above. click here and tell me the best dresser which can match my white furniture very well. Anyway, thanks. Hi! I think you should be the one to pick out your own furniture, you would know best! I suppose you can always hire an interior decorator. But go with function first. In this scenario, the online furniture seller should provide you the option for easy & fast return/exchange.